We have grouped the best deals and coupons for the ANNIVERSARY SALE of Aliexpress and Gearbest. The ANNIVERSARY SALE is a special festival with millions of highly discounted prices and exclusive coupons at Aliexpress.com and Gearbest.com and has just started! The SALE promotion lasts until the 31st of March till the end of the day. The ANNIVERSARY SALE Deals and Coupons are valid on the ANNIVERSARY SALE period and have a limited time availability. Get the most out of this unique sale festival. Enjoy the ANNIVERSARY SALE and get the best deals! Vernee Apollo Lite 4G+ Phablet Android 6.0 MTK6797 Deca Core 4GB RAM 32GB ROM 16…. LEAGOO KIICAA MIX 4G Phablet Full Screen 13.0MP + 2.0MP Rear Cameras Octa Core . Ulefone Paris 4G Smartphone Android 5.1 2GB RAM 16GB ROM 5MP + 13MP Cameras 5…. Lenovo HW01 Smart Wristband BLE 4.2 / Heart Rate Monitor / Sleep Manage / Spor..
DISCLAIMER: Prices shared might vary according to your locationthe seller’s/shop’s decisioncurrencies fluctuations or specific terms and conditions, to check the latest updated price it is recommended to check the shared link in each deal. 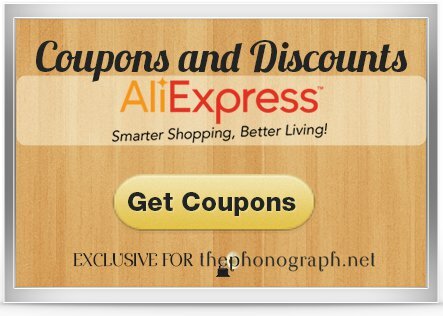 Coupons have a limited number available, ThePhonograph.net has no control over the quantity of coupons available or to re-stock this amount. If the coupon is not applicable be sure to use it for the specific product that the coupon links to. If still it does not apply the discount, unfortunately, it will mean that you discovered the coupon too late and it has ended. All the deals shared in this page can be found at the shop’s and seller’s sites, it is up to them to respect the deals and prices offered in their corresponding official URL. The rules, conditions and terms that may apply to each deal, discount or coupon should be consulted on each shop’s website. Aliexpress 11.11 Festival & Gearbest 11.11 Festival, Black Friday Amazon, Black Friday Aliexpress & Gearbest, Cyber Monday Amazon, Cyber Monday Aliexpress & Gearbest. Photographs Copyright All photographs published in this review/article are protected by copyright laws; the use, reuse, publication, modification and/or copy of them is strictly prohibited and legally penalized unless a written permission has been emitted by Lucas Martin Rossi | Professional Photographer. This photographs copyright disclaimer does not apply to photographs appearing in Ads in this page. The copyright of the photos appearing in Ads belong to their respective holders, owner and/or author. ThePhonograph.net nor Lucas Martin Rossi | Professional Photographer hold any copyright rights of the photos in Ads in this page nor claims their property or authorship, the same applies to the images published in the NEWS category. Amazon Associates Disclosure As an Amazon Associate I earn from qualifying purchases. We are a participant in the Amazon Services LLC Associates Program, an affiliate advertising program designed to provide a means for us to earn fees by linking to Amazon.com and affiliated sites. Third Parties Disclosure All product names, company names and logos are trademarks™ or registered® trademarks of their respective holders. Apple®, iPod®, iPhone® and iPad® are registered trademarks of Apple Inc. Android™ is a trademark of Google Inc. Use of these marks and any other third-party trademarks are for identification purposes only and does not imply endorsement or affiliation. Copyright © 2019 - ThePhonograph.net - All Rights Reserved. Photographs © 2019 - Lucas Martin Rossi | Professional Photographer - All Rights Reserved.